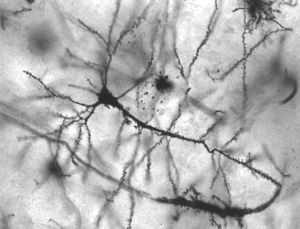 Neurons in person with epilepsy, 40x magnified. Interventions for neurological disorders include preventative measures, lifestyle changes, physiotherapy or other therapy, neurorehabilitation, pain management, medication, operations performed by neurosurgeons or a specific diet. The World Health Organization estimated in 2006 that neurological disorders and their sequelae (direct consequences) affect as many as one billion people worldwide, and identified health inequalities and social stigma/discrimination as major factors contributing to the associated disability and suffering. Part of the causal chain leading to Alzheimer's disease. Although the brain and spinal cord are surrounded by tough membranes, enclosed in the bones of the skull and spinal vertebrae, and chemically isolated by the blood–brain barrier, they are very susceptible if compromised. Nerves tend to lie deep under the skin but can still become exposed to damage. Individual neurons, and the neural circuits and nerves into which they form, are susceptible to electrochemical and structural disruption. Neuroregeneration may occur in the peripheral nervous system and thus overcome or work around injuries to some extents, but it is thought to be rare in the brain and spinal cord. The specific causes of neurological problems vary, but can include genetic disorders, congenital abnormalities or disorders, infections, lifestyle or environmental health problems including malnutrition, and brain injury, spinal cord injury, nerve injury and gluten sensitivity (with or without intestinal damage or digestive symptoms). Metal poisoning, where metals accumulate in the human body and disrupt biological processes, has been reported to induce neurological problems, at least in the case of lead. 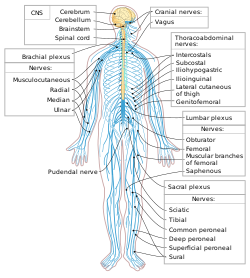 The neurological problem may start in another body system that interacts with the nervous system. For example, cerebrovascular disorders involve brain injury due to problems with the blood vessels (cardiovascular system) supplying the brain; autoimmune disorders involve damage caused by the body's own immune system; lysosomal storage diseases such as Niemann-Pick disease can lead to neurological deterioration. The National Institutes of Health recommend considering the evaluation of an underlying celiac disease in people with unexplained neurological symptoms, particularly peripheral neuropathy or ataxia. In a substantial minority of cases of neurological symptoms, no neural cause can be identified using current testing procedures, and such "idiopathic" conditions can invite different theories about what is occurring. Many of the diseases and disorders listed above have neurosurgical treatments available (e.g. Tourette's Syndrome, Parkinson's disease, Essential tremor and Obsessive compulsive disorder). Neurological disorders in non-human animals are treated by veterinarians. A neurological examination can, to some extent, assess the impact of neurological damage and disease on brain function in terms of behavior, memory or cognition. Behavioral neurology specializes in this area. In addition, clinical neuropsychology uses neuropsychological assessment to precisely identify and track problems in mental functioning, usually after some sort of brain injury or neurological impairment. Alternatively, a condition might first be detected through the presence of abnormalities in mental functioning, and further assessment may indicate an underlying neurological disorder. There are sometimes unclear boundaries in the distinction between disorders treated within neurology, and mental disorders treated within the other medical specialty of psychiatry, or other mental health professions such as clinical psychology. In practice, cases may present as one type but be assessed as more appropriate to the other. Neuropsychiatry deals with mental disorders arising from specific identified diseases of the nervous system. One area that can be contested is in cases of idiopathic neurological symptoms - conditions where the cause cannot be established. It can be decided in some cases, perhaps by exclusion of any accepted diagnosis, that higher-level brain/mental activity is causing symptoms, rather than the symptoms originating in the area of the nervous system from which they may appear to originate. Classic examples are "functional" seizures, sensory numbness, "functional" limb weakness and functional neurological deficit ("functional" in this context is usually contrasted with the old term "organic disease"). Such cases may be contentiously interpreted as being "psychological" rather than "neurological". Some cases may be classified as mental disorders, for example as conversion disorder, if the symptoms appear to be causally linked to emotional states or responses to social stress or social contexts. On the other hand, dissociation refers to partial or complete disruption of the integration of a person's conscious functioning, such that a person may feel detached from one's emotions, body and/or immediate surroundings. At one extreme this may be diagnosed as depersonalization disorder. There are also conditions viewed as neurological where a person appears to consciously register neurological stimuli that cannot possibly be coming from the part of the nervous system to which they would normally be attributed, such as phantom pain or synesthesia, or where limbs act without conscious direction, as in alien hand syndrome. Theories and assumptions about consciousness, free will, moral responsibility and social stigma can play a part in this, whether from the perspective of the clinician or the patient. Conditions that are classed as mental disorders, or learning disabilities and forms of intellectual disability, are not themselves usually dealt with as neurological disorders. Biological psychiatry seeks to understand mental disorders in terms of their basis in the nervous system, however. In clinical practice, mental disorders are usually indicated by a mental state examination, or other type of structured interview or questionnaire process. At the present time, neuroimaging (brain scans) alone cannot accurately diagnose a mental disorder or tell the risk of developing one; however, it can be used to rule out other medical conditions such as a brain tumor. In research, neuroimaging and other neurological tests can show correlations between reported and observed mental difficulties and certain aspects of neural function or differences in brain structure. In general, numerous fields intersect to try and understand the basic processes involved in mental functioning, many of which are brought together in cognitive science. The distinction between neurological and mental disorders can be a matter of some debate, either in regard to specific facts about the cause of a condition or in regard to the general understanding of brain and mind. ^ KT, Thakur; E, Albanese; P, Giannakopoulos; N, Jette; M, Linde; MJ, Prince; TM, Steiner; T, Dua (14 March 2016). Mental, Neurological, and Substance Use Disorders: Disease Control Priorities, Third Edition (Volume 4). Chapter 5 Neurological Disorders. Washington (DC): Patel V, Chisholm D, Dua T, et al. ^ a b Zis P, Hadjivassiliou M (26 February 2019). "Treatment of Neurological Manifestations of Gluten Sensitivity and Coeliac Disease". Curr Treat Options Neurol (Review). 21 (3): 10. doi:10.1007/s11940-019-0552-7. PMID 30806821. ^ a b Sanders, T.; Liu, Y.; Buchner, V.; Tchounwou, P. B. (2009). "Neurotoxic effects and biomarkers of lead exposure: A review". Reviews on Environmental Health. 24 (1): 15–45. PMC 2858639. PMID 19476290. ^ "Coeliac disease: recognition, assessment and management. NICE guideline [NG20]". National Institute for Health. September 2015. Retrieved 18 September 2017. ^ Butler, C (1 March 2005). "Neurological syndromes which can be mistaken for psychiatric conditions". Journal of Neurology, Neurosurgery & Psychiatry. 76 (suppl_1): i31–i38. doi:10.1136/jnnp.2004.060459. PMC 1765684. ^ Roelofs, K.; Pasman, J. (2016). "Stress, childhood trauma, and cognitive functions in functional neurologic disorders". Handbook of Clinical Neurology. 139: 139–155. doi:10.1016/B978-0-12-801772-2.00013-8. ISSN 0072-9752. PMID 27719835.